Deer Antler Facts: Deer antlers are among the fastest-growing animal tissues on the planet. In fact, researchers have discovered many astounding facts about deer antlers that most people may not know. According to biologists, the antlers on a deer’s head are not just a distinctive trait that is easily recognizable. Deer antlers serve many purposes which are linked to the basic survival and the lifestyle of deer. Before delving deep into these deer antler facts, it is important to note that deer types are broken down by family. The size, shape, or color of the antlers may differ from one family to another. For instance, the color of antlers can range from white racks to a simulated dark chocolate. Deer antlers can grow up to an inch per day. That said, the speed and size of deer antler growth depend on the genetics, nutrition and the age of the deer. The typical growth rate of antlers ranges around ¼ of an inch in a day. When antlers begin to grow, its normal growth pattern usually results in the antlers forming and then splitting off to create a bud on the pedicle. Generally, it takes about a month for this cycle to complete for each line for deer antler. At this rate, it takes about 4 months for a full set of antlers to grow. If you look at the growth of the whitetail deer antler, you may be surprised to know that, there are a number of different interesting facts. Most notable is the fact that antlers are bone formations that come from the pedicle on top of their heads. This bone is part of the skull in the male deer and can be seen on the outside growing until it is fully mature. Rut season for deer varies as per location and species, and accordingly, the timing when deer shed their antlers varies as per rut season. Experienced antler hunters are well aware that it is very difficult to try and guess when the deer will shed their antlers due to various factors at play. The biggest factor which impacts the timing is latitude. Simply speaking, deer at different latitudes shed their antlers at different times. Bucks in the northern states typically shed their antlers around December. On the other hand, bucks in the southern states continue to shed their antlers through March and April. Similarly, altitude is another important factor which impacts the time when the deer will shed their antlers. Altitude determines weather, depth of snow, availability of food and nutritional value of food, which combined all together impact the timing of antler casting. Both mule deer and the whitetail deer are known to shed their antlers at different times. Therefore, when you wish to know when do deer shed their antlers, you need to be aware that different months apply for whitetail versus mule deer. Whitetail deer, which is known for coming from the Virginia area, shed their antlers around the months of January and February. On the other hand, the mule deer tend to wait a little longer and shed theirs in February or March. Either way, both the mule deer and the whitetail deer end the season without their antlers. The entire process takes around 2 to 3 weeks before the entire bone structure is gone. The reasons why the antlers are shed is much easier to answer. At the end of the rut season for deer, the testosterone level of bucks starts to fall. This decrease in testosterone level weakens the bones and tissues at the base of the antlers causing the antlers to fall. Shedding of antlers is such a quick process that it is common for the antlers to be strong one day and then fall off the next. Sometimes, bucks which are injured may shed their antlers even earlier. However, bucks that are at the peak of their physical fitness will usually keep their antlers longer than bucks that have started to weaken. Most hunters used to earlier believe that bucks try to find some privacy before shedding their antlers. However, there is no evidence to suggest the bucks are even aware that their antlers are about to fall off. In fact, biologists are quite certain that the whole process doesn’t cause any pain or discomfort to bucks. While the end of winter months is the time when deer shed their antlers, spring is usually the time when deer start growing their antlers. March and April are the specific months of the year when you can see the evidence of re-growth. It is around this period that deer will start to grow their antlers to into a fully grown set. Since the earliest known existence of man, anyone who has witnessed this incredible process of deer antler growth has been fascinated by the way antlers take shape. As antlers are the fastest growing bone material known to biologists and medical scientists, the entire process can be astounding and fascinating to see. Many people believe, that a good summer among bucks, watching deer antlers grow is not an experience to be missed! During the 120 day period between March and late August, deer antlers can grow in excess of 200 inches for a fully mature buck. But for deer antlers to grow such fast, there are several factors which need to be favorable. Some of the commonly known factors include high levels of testosterone, good nutrition, and family’s genes. Deer antlers can reach their true potential if a buck is healthy and has access to nutritious food sources throughout the year as well as the growing period. Can the female deer (doe) grow antlers? The response to this question is yes. However, it is not a norm, especially since female deer have a limited amount of testosterone in their body. Testosterone plays an important role in antler growth and formation. The higher the level of testosterone, the more pronounced the antlers will be. Lower the level, the less pronounced formation will be seen. 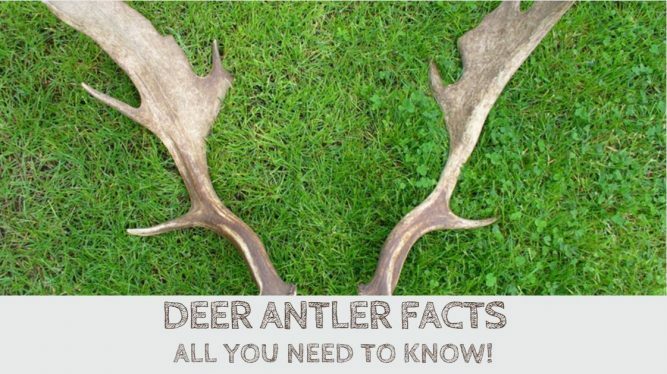 There are many deer antler facts that you can learn about. Many of which most people may or may not know. Some of the more stunning facts usually relate to how fast their antlers grow. For instance, the deer antlers can grow as fast as 1 inch in a day. Another fascinating aspect is the shape of antlers growing into different branches. It is primarily male deer who are meant to have antlers. While it is possible for a female doe to have antlers but it is not common. It is also important to note that deer antlers rarely harden and are not meant for protection or fighting. Further Reading: Deer Antler Velvet—What Is It, How Does It Work? It is difficult to find this information on other websites. Thanks for writing about deer antlers.